The Old Masters are known for painting beautifully detailed, but highly posed still life paintings. 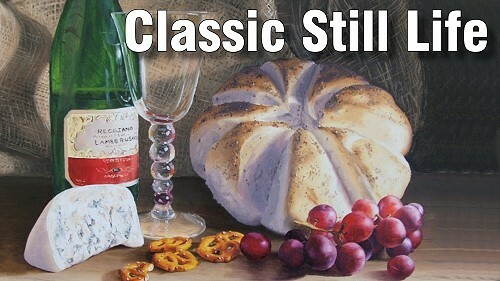 In this class we will paint our own classic still life, just like the Old Masters used to. 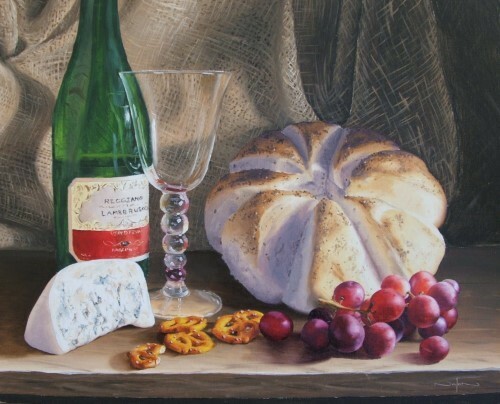 Using techniques from previous still-life lessons, Nolan composes the scene for this painting. He then takes dozens of photos of different arrangements of the elements. By taking the photos from different angles and distances, he actually amasses quite a number of possible still life paintings for future use. Once he finds the very best composition for this painting, he draws out the template on a piece of paper equal to the size of the canvas and then transfers it. Like Nolan, transfer your template to canvas. 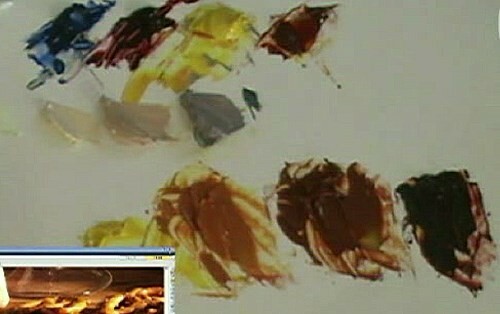 Then mix the colours you will need, carefully matching each against the reference photo. Starting at top right, block in the background fabric colours. 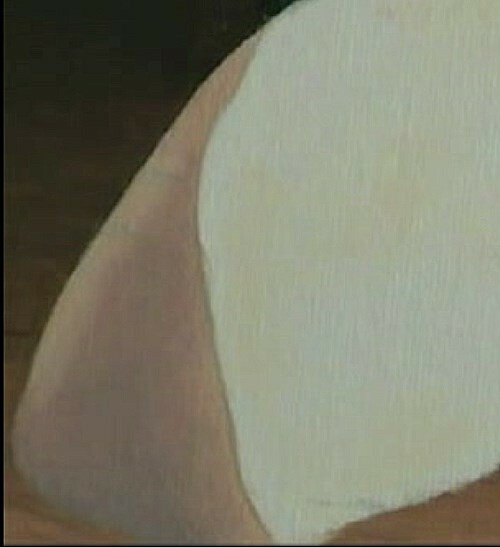 Apply the skills you learned in the class on painting folds. Then blend the colours together to get the basic shadings. Use the highlight colour to create the Hessian weave (burlap) effect in the fabric. Use the same colours to get the basic shadings for the breadboard table top. Use Nolan's techniques for creating both the looking-in effect and the wood grains on the tabletop. 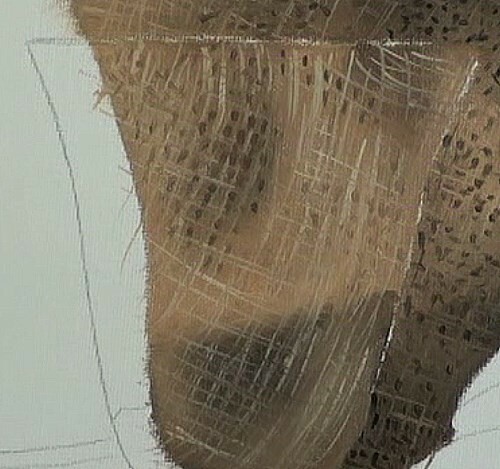 Begin blocking in the wineglass, beginning with the area of greatest distortion, then adding the areas of basic shadings. 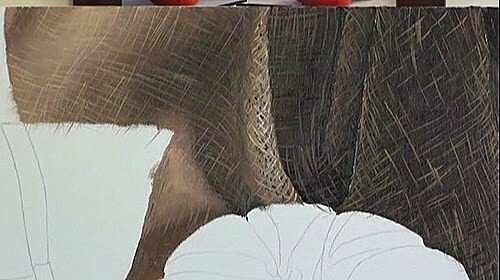 Blend your shadings together, being careful to leave a hairline width of white canvas to mark the outline of the glass. 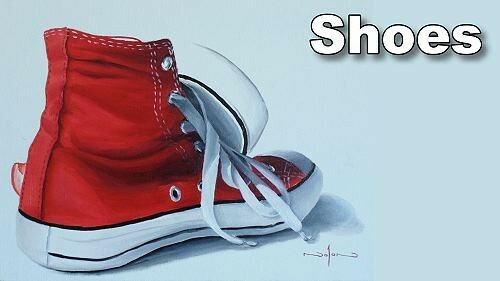 Once your basic shadings are in, use a rigger brush to apply the highlight colour, working in the direction of the distortions. Note the technique Nolan uses to suggest the Hessian effect as seen through the glass. Where appropriate, use your shadow color to detail the “holes” in the Hessian weave. Mix the colours you will need for the wine bottle. Begin blocking in the darkest colour, starting at the top of the bottle and moving down to where there is wine in the bottle. 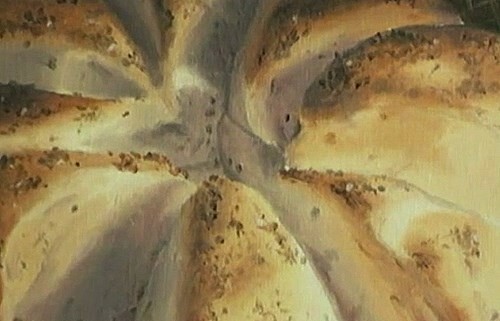 Look for the distortions and the color changes as you paint. 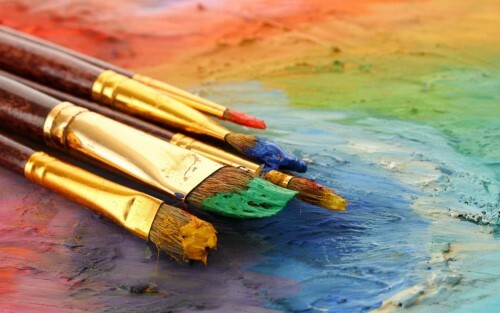 As you blend, note that there are no really hard lines – it's more of a blurred effect. 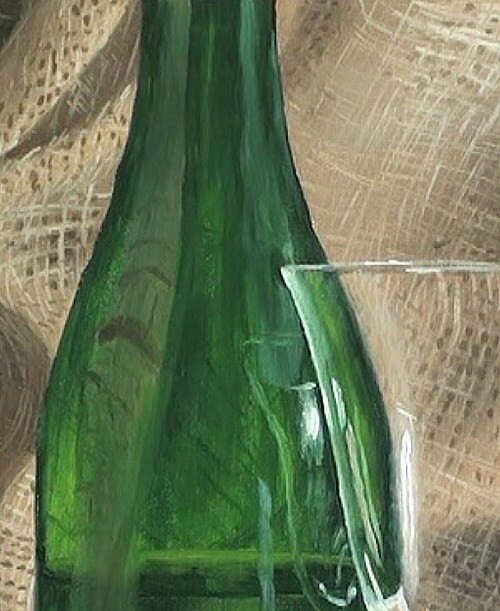 When you paint the wine bottle behind the glass, look for other distortions. Once you have the base coat on the bottle, paint a suggestion of the Hessian weave behind it. A few flicks here and there should do it. Once you begin painting the part of the bottle with the wine in it, adjust the colour of your paint accordingly. Paint carefully around the label. Be sure to highlight the meniscus (curved upper surface of a column of liquid). Move down and paint the bottom of the bottle. Carefully mix the colours for the reflected objects as they appear on the glass and paint them in. 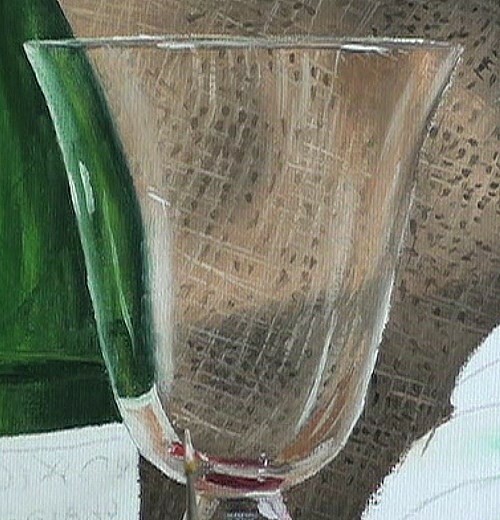 Use the same procedure to paint the stem of the glass, but give extra care to placing the many spots of reflected light. 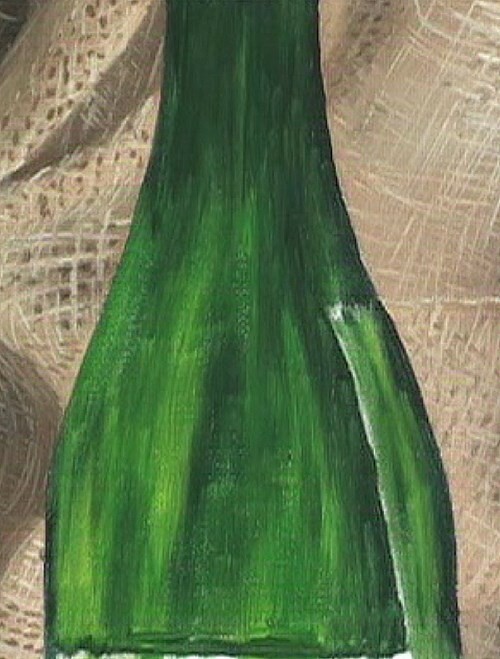 Now paint the reflected objects onto the bottle, noting their degree of distortion and intensity of colour. Remember that the reflections will be soft and subtle. Now add the light reflections and sparkles. Move on to the base of the wine glass, using the same procedure as you did above. Add the shadows, both those that appear on the glass and those that the glass casts on objects around it. 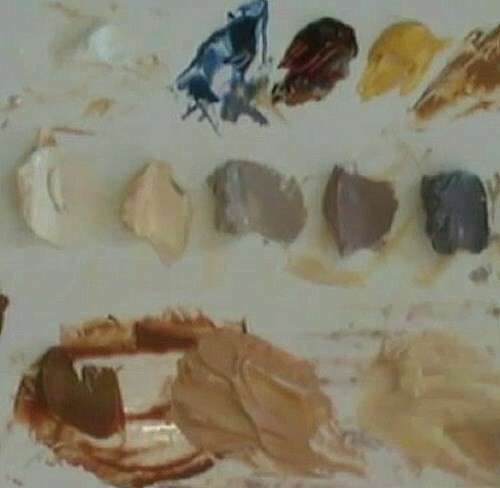 Examine the reference photo to determine the colours you will need. Get the tonal value right first, then adjust for the basic mid-tone colour, highlights, and shadows. 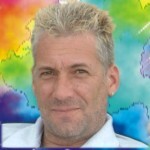 Using a tool such as a Color Buster or Tonal Chart is useful at this stage. 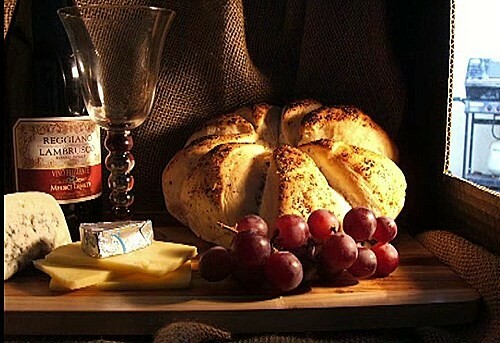 Begin by applying a light layer of white, thinned with medium, over the front face of the cheese. This will prevent the other colours from overpowering the cheese. 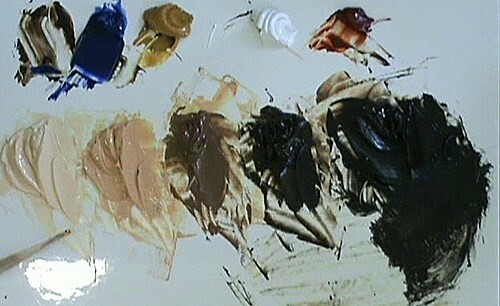 Next, using dabs and dashes, apply the lightest tones where appropriate. Add a few little touches of texture. 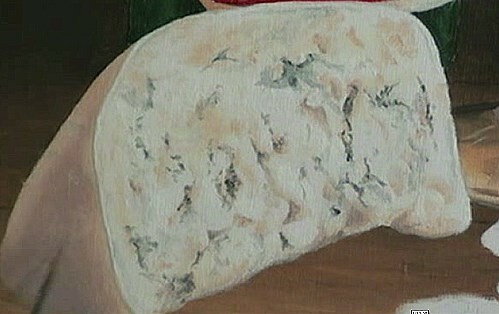 Move on to painting the background of the little holes/indentations in the cheese, using the second lightest colour. Starting with the second darkest colour, begin blocking in the left side of the cheese. Adjust the tones as you go, using the reference photo as your guide. Blend the colours and add the highlights. Now paint the holes and indentations with the second darkest colour. Thicken the paint in areas where there is more texture. Follow Nolan's example as you go back and fade out, define, or apply shadows to the indentations. Next, add a white outline to indicate the thickness of the cheese. You will add more definition to this area after you finish the veining. 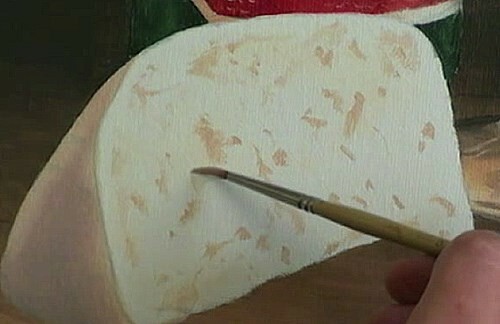 Note that it is important to not only paint the veins, but also to show that the vein is receding into the cheese itself. Mix the tonal ranges of blues that you will need for the veins. 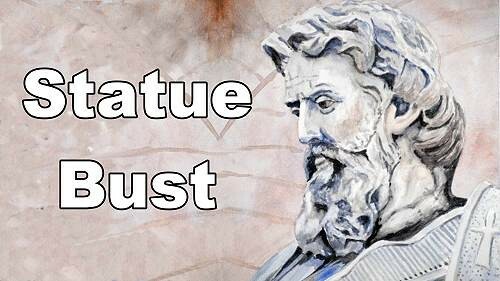 Start out by applying subtle lines of veining, then continue by adding a more bolder blue for the darker veins. Finish up by using your blue vein color to outline the white in places around the skin to accentuate its thickness. Mix the paints you will need for the pretzels. Starting with the pretzel to the left, begin blocking in the pretzel colours. Then blend the colours, followed by adding the highlights, shadows, and fine details. Use Nolan's technique for “salting” the pretzel. Add the reflections on the shiny surface of the pretzel. 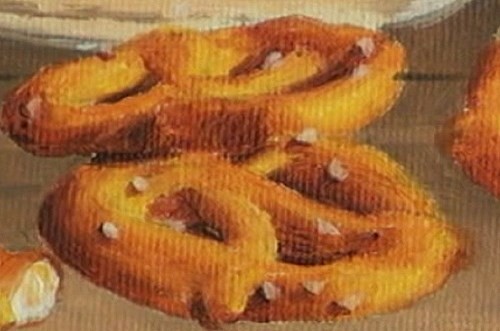 The same technique will be used to paint the remaining pretzels. 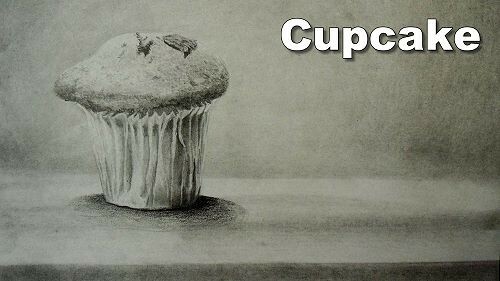 Examine the reference photo to determine the colours you will need. Because of the shapes and angles in the bread, you will need to mix quite a few bread tones, both the inside and the toasty crust, plus highlights and shadows. Remember that there are lots of colours reflecting off the bread so just don't assume that the bread is white. Carefully examine each variation to be sure you are getting it right. NOTE: Keep your paint mixes as you move from bread, to grapes, to stems. There may be opportunities to use the colour again. You will be painting only one slice for demonstration purposes. Begin by blocking in lightly the correct colours in the correct places. If needed, make an impromptu mix when the shade you have is just not right. 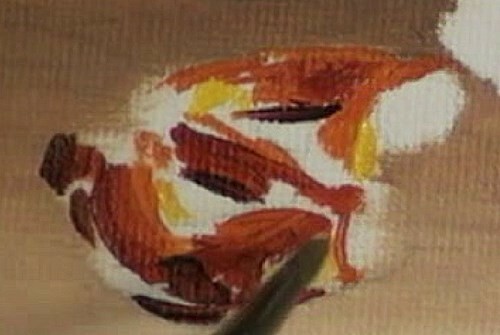 Note how Nolan applies the very thin bands of paint toward the edge of the bread to get the effect of gradual shading. See how effective the clean, dry brush technique is when you go to do the blending. Add in the details. Don't be afraid to use your finger, like Nolan does, to soften in those details. Paint the sesame seeds and the shadows they cast, using the technique that Nolan demonstrates. Look carefully to determine all the different colours in the grapes, including highlights and shadows. Try painting each grape individually by mixing impromptu colours for each. Starting with the grape on the left, block in the colours where you see them. 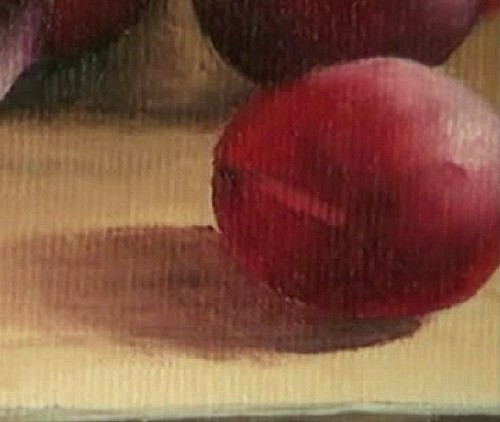 Use a dry brush tapping technique for blending. Try to keep the integrity of each colour. Add highlights in a thick layer, then blur out any hard edges. Adjust shadowy areas. The grape may be a tiny object, but it's all about the details in getting it to look real. Move back from your painting often to see if it looks right. Watch out for lost and found lines. They will help differentiate one grape from another. Leave a tiny white space between grapes in the dark shadows so that you can easily see them while working. Capture the reflections on the grapes even in the dark shadows as Nolan does. Keep the shape of the grapes in tact as you work. 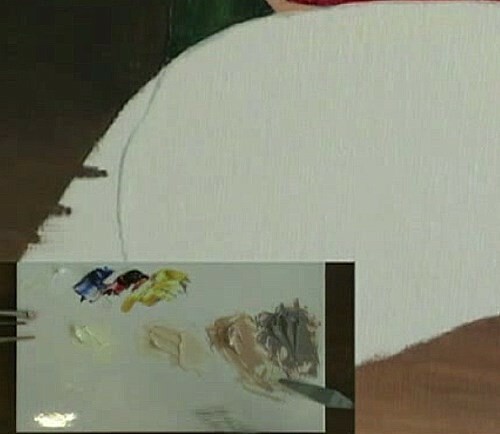 Add in the detail work after you have finished the basic shading of the grape – things like little imperfections and reflections. 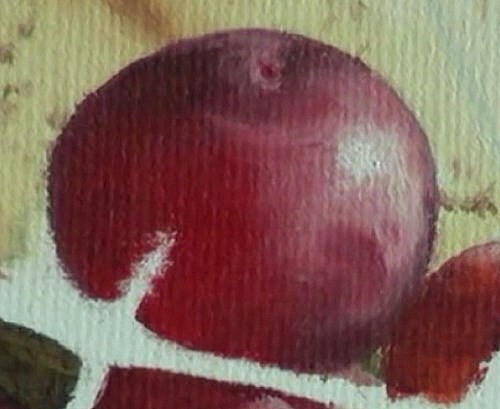 Don't be afraid to use your fingertip to lift off a bit of paint in an area to give that transparent look to the grape. Block in the correct colours in the correct places. Get the basic shadings right to show the curling nature of the stems. Preserve the roundness also. 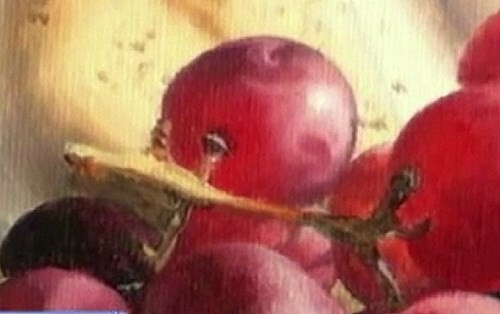 In painting the grape, don't be too concerned if you overpaint your grape into the stem. That way you don't have to make your stem too wide to fill in any gaps. Be sure to get the shadings correct where the stem connects to the grape. If a stem gets lost against the background, leave it that way – it's natural. Mix the table colours to form the shadows, including the tones to indicate that the shadow grows lighter as it moves away from the object. Accurately portray the shape of the shadow. Add some of the grape colour to the shadow to make it look realistic. Imitate Nolan's brush strokes in fading out the shadow.